Book clubs across the country are in for a treat. It isn’t often that you head to the theater to see the film adaptation of a favorite book and leave feeling satisfied, perhaps even elated. “The Help,” adapted from the hugely popular Kathryn Stockett novel, gives all reason to be delighted. Tate Taylor, screenwriter and director, made a bold and accurate decision to cut the narrators of the story from three to one for the movie. Although the novel had two housekeepers and a young, aspiring journalist narrating the story, Taylor left the job to one character. His choice for sole narrator: Aibileen, the self sacrificing mother who raised 17 white children and whose own son died at the hands of white intolerance. Viola Davis (“Doubt” 2008) plays the role of the tormented yet stoic housekeeper to perfection. 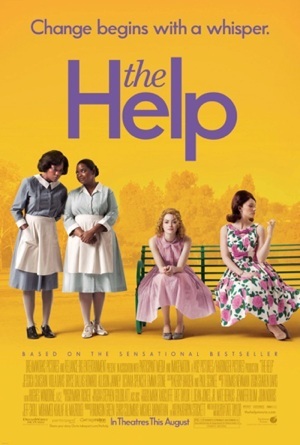 The additional cast of Octavia Spencer, Emma Stone and many other credible actors helps to solidify “The Help” as a winner. Set in the 1960s in Jackson, Mississippi, Skeeter (Stone, “Crazy, Stupid, Love” 2011) returns home after earning her degree in journalism and lands a job with the local newspaper. Unfortunately, the job is to write the “Miss Myrna” column, answering letters about cleaning. Although Skeeter has confidence in her writing skills, she knows nothing about cleaning. Lacking the qualifications for her new job, she seeks the help of her friend, Elizabeth Leefolt (Ahna O’Reilly, “Forgetting Sarah Marshall” 2008) while attending bridge club at her home. Skeeter would like to get the real life perspective from Elizabeth’s maid, Aibileen, in answering questions for the “Miss Myrna” column. Soon after Elizabeth agrees to Skeeter’s request, Hilly (Dallas Bryce Howard, “Spider-Man 3” 2007), the snootiest of the socialites, begins telling the gals about her idea for an “initiative” requiring all whites in Jackson to provide a separate toilet in their homes for “the help.” Skeeter sees through this unjust act as hurtful to Aibileen and quietly begins an “initiative” of her own. On the advice of a New York City book editor (Oscar winner Mary Steenburgen), Skeeter decides she should tackle this gritty story and asks Aibileen if she would tell her side of what it is like to work for a white family in the Deep South. After much resistance by Aibileen, an agreement is finally made. Once the two begin their work, secretly and anonymously, they are able to recruit more maids to tell their stories, with an equal amount of fear and courage. Aibileen’s best friend, Minny, who has a difficult time holding back her ‘sass’ and who has done “a terrible, awful (thing) to Miss Hilly” is the first to join Aibileen and Skeeter. Spencer, who is pitch perfect in this role, portrays the amusing, no-nonsense Minny. The most entertaining side character is a toss up between Celia Foote (Jessica Chastain, “Tree of Life” 2011) and Mrs. Walters (Oscar winner Sissy Spacek). Chastain plays the blonde bombshell outsider who desperately wants to be accepted into the socialite circle, but ends up finding something resembling friendship in her new housekeeper, Minny. Celia, a sweet and innocent dingbat, knows nothing of the “rules” when it comes to how whites are expected to treat their help. Minny tries to educate her, but Celia wants nothing of it. Chastain makes it very easy to love Celia. Spacek’s character, Mrs. Walters, is the mother of hateful, controlling Hilly. More screen time for the award-winning actor, who most recently entertained us in HBO’s “Big Love,” would have been a treat for viewers. Another veteran to the screen, Cicely Tyson, appears in the movie through flashbacks as Skeeter remembers her loving nanny, Constantine. “The Help” is full of lighthearted and amusing scenes, but don’t let that fool you. It is also a story that tackles a serious and turbulent time in our recent history. There are many gripping, heart wrenching and tender moments in the film that may bring forth painful memories for those viewers who lived through the ‘60s. As for the younger set, the movie will serve as a lesson in history, as well as humanity, for middle school and high school children. Bottom Line: It is rare that a film can tackle, with such accuracy, a difficult point in history with humor in such a way that it does not take away from the solemn facts. The tremendous acting, especially from Davis and Spencer, helps to make “The Help” an adapted screenplay that needs no help.